Opening Thoughts: As I read this text tonight I was deeply convicted. I want to talk about three very specific ways a person can confess Christ, and furthermore three ways one can deny Him. For many of you the first two points may be a glaring and obvious, “I would never do that”, but most of us will feel the pain of the third denial. I’m not drawing any parallels here, but my hope is that as we read through to the third denial we will be like Peter and experience grief over our actions, then with a new hope rush toward to the risen Savoir, be filled with His Spirit and boldly proclaim the Good News. Main Text: Luke 12:8-9 ESV .. “And I tell you, everyone who acknowledges me before men, the Son of Man also will acknowledge before the angels of God, but the one who denies me before men will be denied before the angels of God. Matthew 10:32-33 ESV .. So everyone who acknowledges me before men, I also will acknowledge before my Father who is in heaven, but whoever denies me before men, I also will deny before my Father who is in heaven. First Denial & Confession: In our main text from Luke, Jesus is explicitly speaking of denial in the face of persecution. Just prior to saying this He issued a serious warning to the crowds in regard to the teachings of the Pharisees and denouncing them as hypocrites. His message was clear as day, He was calling people to genuine repentance and trust in Him alone in place of the man-centered, extra-biblical, self-righteous attempt to please God that the Pharisees had burdened them down with. Any attempt to please God outside of Faith alone in Christ alone is like pounding in the nails instead of climbing on to the cross beside Him. Jesus was well aware that his message was going to spark rage into His religious opposer’s and that they would not only persecute and murder Him, but they would also heavily persecute and even massacre anyone who professed His name in exchange for their scandalous leadership. He has called everyone with ears to hear to be fearless of what man can do to you, because in the end, what more can they do to you after they kill you? Nothing. Christ had already made it evident, through raising the dead, that He had ultimate authority over death, so He was saying that “anyone who follows Me has no need to fear because, as you have seen, I will indeed raise you back up.” With this Jesus preaches the doctrine of Hell harder than any man has dared. He sets Himself up as sinful man’s only hope of escaping the fury of God’s wrath. He declares that anyone who forsakes Him is trading their only chance of eternal deliverance for temporal comfort and they will inevitably be found in their sin on judgement day. Regardless of their church attendance, their acts of kindness or pious living, Jesus will distance himself from them on that day and they will lose their soul for eternity. I mean, if you think about it, for thousands of years men have gone to war and have sacrificed their lives for the good of the kingdom, their country and their families. Christ is worth far more than any freedom we could have on this earth. The first denial is to turn in the face of, or for the fear of persecution, and the opposite is to stand strong and confess even to the point of death. Second Denial & Confession: World Religions who do not confess Christ as the Son of God and the Only way in which anyone is saved from eternal death and hell is the second denial of Christ. Believe it or not, this type of denial has infiltrated the church in a large way. I have seen missionaries stand up in Christian churches and declare that the God of Islam is the same God of the Christians, and that one can remain a Muslim and still be a Christian. I’ve also heard Pastors say they believed people would have eternal life if they were faithful to the only light they knew?!? And of course in this past year many professing believers have openly embraced Rob Bell’s teaching that in the end everyone makes it to heaven after they have paid their due. Sadly this isn’t a foreign concept in evangelical churches today. Jesus wasn’t a pushover and He didn’t mess His words up. Jesus emphatically said “I am THE way, THE truth and THE Life”, not, “A way, A truth and A life.” Are you ashamed or have you ever been embarrassed of the Narrow message of the Bible? 1 John 2:23 ESV .. No one who denies the Son has the Father. Whoever confesses the Son has the Father also. John 14:6 ESV .. Jesus said to him, “I am the way, and the truth, and the life. No one comes to the Father except through me. 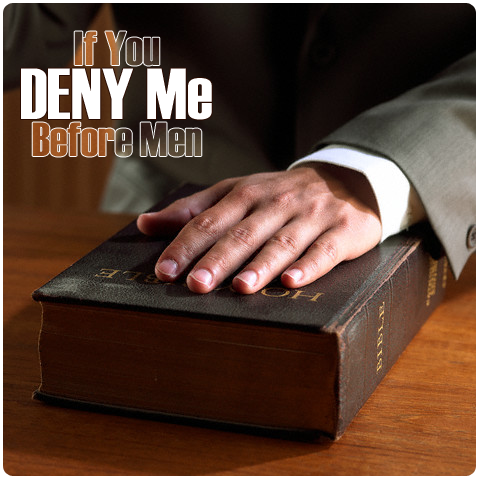 Third Denial is an Unwillingness to Confess: In Matthew 17:5 we read that God spoke from heaven saying ……. “This is my beloved Son, with whom I am well pleased; listen to him.” You have to stop and think for a moment, if you were standing there with Jesus and God spoke from heaven and said, “This is my Son, listen to him”, I’m pretty sure most of us would be waiting with baited breath for Jesus to say something so we could listen right? I wish it were so, most of us have 3 or 4 copies of His Word right in our homes and yet almost entirely disregard the last command he gave us before He left. Let me ask a question, when Jesus gave the great commission did he say “Go on now, get out a here you guys and go love on some some people, and if an opportunity arises where you sense someone is seeking, share with them about my love in a culturally relevant way. Remember to always focus on on how intrinsically valuable they are and how deep down they have goodness in them. Don’t point them to the picture of the Bloody Cross which magnifies how desperately wicked we really are, after all that may offend them and we don’t want to do that”? I’m sure you all know that this is far from what Jesus said, but rather, “Go and preach the Gospel, make disciples and teach them to obey my commands”. His message does not lack love it is the very picture of love, yet many of us in the church can’t open our mouths to share the truth of the Gospel to those all around us. Instead we say things like, “It’s not my calling”, or, “I just show people the love of Jesus through my life”. Back to the words of God though, “This is My Son, Listen to Him”. If we are truly His children we should not only be obedient but it should be our great privilege to serve, suffer and even die for Him. Take a look at the passage below and notice how unstoppable the early Christians were. Acts 8:1-4 ESV … And Saul approved of his execution. And there arose on that day a great persecution against the church in Jerusalem, and they were all scattered throughout the regions of Judea and Samaria, except the apostles. Devout men buried Stephen and made great lamentation over him. But Saul was ravaging the church, and entering house after house, he dragged off men and women and committed them to prison. Now those who were scattered went about Preaching the Word. Even if through persecution we should lose our jobs or our families we should never cease to declare the message of the Gospel just like those early church Christians. These people were regular Christians back then, they weren’t the strange ones, they weren’t the fanatics, they were legit, genuine believers with a Biblical Gospel which was neither easy for a sinner to receive nor was it culturally relevant. In fact, it was anything but culturally relevant. Acts 26:9-11 ESV “I myself was convinced that I ought to do many things in opposing the name of Jesus of Nazareth. And I did so in Jerusalem. I not only locked up many of the saints in prison after receiving authority from the chief priests, but when they were put to death I cast my vote against them. And I punished them often in all the synagogues and tried to make them blaspheme, and in raging fury against them I persecuted them even to foreign cities. Paul persecuted them so hard that even when they left their homes and everything they knew and fled to other cities he pursued them and tracked them down. The more I think about these precious brothers and sisters the more I want what they had. They left their homes because if they stayed they would have died, but they weren’t running for fear of death, they were running so they could live and preach. A dead person can’t preach! They lived for the kingdom, they had the same zeal as Paul later had when he said, “To live is Christ and to die is gain”. They knew that everything in life was about making much of Christ and declaring His gospel to dying people even though it would cost most of them their own lives. Does our faith look like that? Do we live to make much of Christ? Do we share the whole gospel with people or do we leave the stuff about sin, hell and judgement out? The third denial is our failure to Listen to our Savoir and preach the Gospel to every creature. I don’t want to stand before the Lord with someone else’s blood on my hands because it made me feel uncomfortable. Do you? Ezekiel 3:17-19 ESV “Son of man, I have made you a watchman for the house of Israel. Whenever you hear a word from my mouth, you shall give them warning from me. If I say to the wicked, ‘You shall surely die,’ and you give him no warning, nor speak to warn the wicked from his wicked way, in order to save his life, that wicked person shall die for his iniquity, but his blood I will require at your hand. But if you warn the wicked, and he does not turn from his wickedness, or from his wicked way, he shall die for his iniquity, but you will have delivered your soul. Jesus teaches the doctrine of Hell harder than any man has dared? Jesus was speaking to his disciples, whom he gave power to. Why does the doctrine of eternal torment still exist? It simply does not come from a clear understanding of the scriptures. Is there some work needed to keep salvation, or did Jesus finish the work? Did Jesus die for everyone or just Christians, who, through their own efforts, keep their own salvation? What kind of persecution have you had to endure? Have you lost your job, family, freedom? Or are those things still in the future? The true gospel is, Jesus took away the sins of the world. Eternal life is knowing God the Father. How much have you studied the doctrine of Hell and eternal torment? Can you prove these doctrines from the pages of scripture, from the original wording? Or do you perpetuate lies and cause people to live in fear? Have you studied to show yourself approved, a workman. Not to fret, even these works of yours shall be tested with fire, you will be saved, but as through fire, just like so many more of us. God truly is good, and merciful, and gracious! Wow! From the word of God, from the command of Christ! That third one does convict. Thank you two or being biblically honest. Its not your opinion and I appreciate that. I have to admit I have had the attitude of sharing the love of Jesus as being my sole witness. It doesn’t work. It really doesn’t! People will completly miss it and just keep on doing what they do. Another thing is this casual christianity bit. What a misleading presentaton of living for Christ.